Burglars are reported to have made off with rings and diamonds worth tens of thousands of pounds after targeting an upmarket jewellers on Fleet Street, London. Detectives from the Metropolitan Police’s Flying Squad are investigating how thieves broke into the upmarket George Attenborough and Son Jewellers at some stage over the weekend. It’s understood the heist took place as thousands of runners competing in the London Landmarks Half Marathon thundered past nearby. The firm advertises items worth tens of thousands of pounds such as Cartier diamond rings on its website. There are reports that the thieves – who are still at large – used drills to gain access to the secure building and complete the raid. A Scotland Yard statement confirmed members of its Serious and Organised Crime Command were involved in the investigation. It said: “Police were called shortly before 2am on Monday, March 25, to a report of a burglary at a jewellers in Fleet Street. “A quantity of jewellery was stolen. An investigation has been launched, led by detectives from the Met’s Flying Squad. “Forensic examination work is continuing at the scene. No arrests have been made. Enquiries are ongoing to establish the circumstances and identify those responsible. 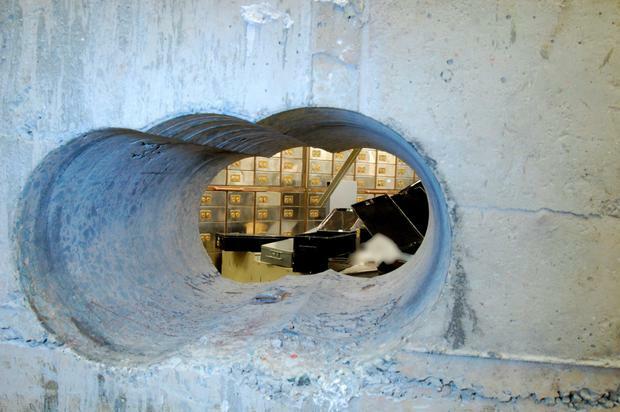 The incident happened a short distance from the Hatton Garden Safe Deposit company, which was raided in April 2015. Of the £13.6m of property stolen in the heist, only around £4.5m – roughly one-third – has since been recovered by police. Earlier this month, alarm specialist Michael Seed – known by the moniker Basil – became the 10th person convicted in connection with the crime when he was found guilty of conspiracy to burgle and conspiracy to handle the proceeds after £143,000 worth of gold ingots, gems and jewellery was found in his bedroom.